This summer, NaturallyCurly had the pleasure of setting up shop and hobnobbing with curlies on both the East and West Coasts. The 3,000 miles between the two coasts has created a difference in not only general social vibes, fashions, and styles, but also the natural hair communities. Let’s take a peek at the two cities we’ve visited – New York and Los Angeles – and see how they measure up when it comes to curly hair! On the LA rooftop at the Grow Out Challenge Celebration. With a population of over 8 million people, NYC comes in as the largest city in the country. Los Angeles pulls in at 2nd place with just under 4 million in habitants. However, Los Angeles is 35% larger than NYC in terms of square mileage, and with a less dense and smaller total population, chances are you’ll see fewer curlies roaming about. Packed with natural-focused salons and stores, Brooklyn holds down the fort as the natural habitat for curly hair on the East Coast. Everywhere we looked there was a TWA or a BAA or some sort of beautiful lock 'updo! On the other hand, LA’s natural community is spread wide and far, from the Valley and Beverly Hills to Compton and Downtown. Curlies escape from the NYC heat in the pool. The two cities couldn’t be more different in terms of climate. Our visit to NYC turned out to be over the hottest weekend the city had on record in over 25 years, with Central Park topping out at 105 degrees! 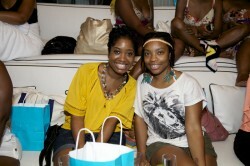 Thank goodness we hosted a pool party to cool things down from the hot and humid summer temperatures! Our Frizz Forecast expertly guided us through how to manage our curls in the drying and frizz-prone climate. 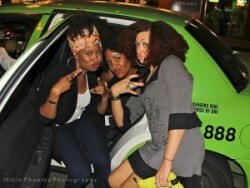 LA naturals enjoy the downtown skyline. Meanwhile on the Left Coast in LA, summer brings with it sunny skies, coastal breezes and highs of 85 that are never too hot. The Frizz Forecast was smiling for the entire weekend we were there! In fact, the Kim Coles Grow Out Challenge Celebration was hosted at a penthouse that had lots of patio space and an open layout for everyone – and their curls – to enjoy the weather! We caught up with a couple of NYC and LA hair bloggers to see what they had to say about their respective cities. Chai and Sheena of SociologyofSheena hang poolside. 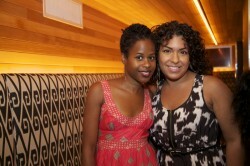 Three words to describe the NYC #naturalhair scene: Spontaneous, thriving, contagious. Your favorite style to rock out on the town: the sixth day twist out that develops a mind of its own and loves the wind more than I do. On the popular perception of #naturalhair beyond the core community: It can certainly be a bit mesmerizing to those outside the "inner circle," who are curious. But I think that's what fuels this movement, women are finally acting on their curiosity rather than ignoring something so beautiful. Your favorite style to rock on the town: A HUGE fluffed out wash and go! The bigger the better — you can't miss me. On the popular perception of #naturalhair beyond the core community: I think there is a lot of love for natural hair in the LA area. Perhaps it's just the particular population, but I see a ton of naturals, and get lots of compliments on my hair from all kinds of people. There are still a lot of weaves out here, so I think a lot of people like the "realness" of natural hair. Since you're from the east coast, any big difference between the two that you notice? 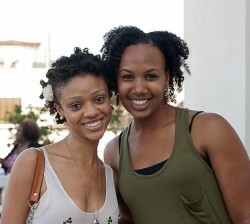 I see a lot of naturals on the east too when I visit, but the look is generally more tamed. Whether it's because they are new naturals and growing their hair out I'm not sure, but I see more TWAs and shorter hair on the east, and out here it's like, big, in your face, hair. I'm always seeing some natural while I'm out shopping and I'll casually stalk her to look at her hair for a little. I'm a creepster, whatever. The moral of the story is that both coasts have a thriving natural scene! It’s a treat to know that a manufacturer is based near you because that means that they really know how their products perform in the local climate. Use this list to find curly hair product manufacturers in your area!